Some of you might know that I participate in a bee block through flickr called do. Good Stitches. Each month a host quilter for each circle tasks the stitchers with making two blocks. Then the quilter assembles the blocks and puts together a quilt to gift to someone in need. This month the Joy circle is making slanted diamond blocks. 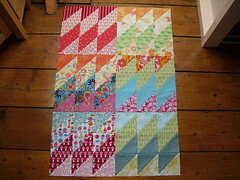 We are using the tutorial here, but doing them in summer brights. Hope I got the colors right! I used some Anna Maria Horner (the orange from Innocent Crush & the green from Garden Party), Amy Butler (Love dots), Joel Dewberry (light pink & dark pink from Modern Meadow) and Paula Prass (yellow dots).